How does the U.S. bypass its own sanctions to buy Kalashnikovs? 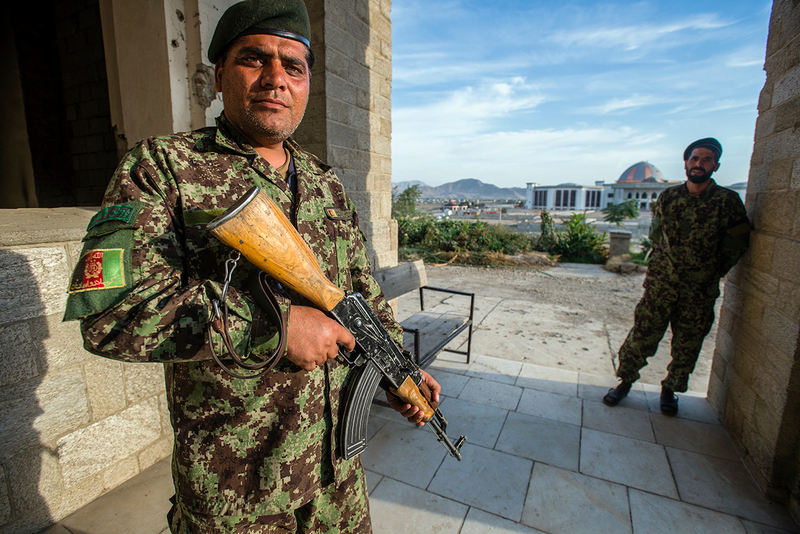 Guard of Darul Aman Palace, ruined during Mujahideen factions fought for control of Kabul in the early 1990s, and building of new parliament on background, Kabul, Afghanistan, 2014. American shipments of the famous Soviet automatic rifle are done without contravening a ban on the purchases of Russian weapons. The rifles in question are both old Soviet ones, as well as those made by East European countries which are violating international agreements with their failure to pay royalties. Despite sanctions and a ban on cooperation with the Russian defense industry, the Pentagon is buying Russian-made Kalashnikov assault rifles to arm the Afghan National Army, said Sergey Chemezov, head of the state-owned defense corporation, Rostec, while speaking to Rossiya 24 TV channel on March 14. "The Americans are not buying weapons directly from Russia, but through former Warsaw Pact countries," Chemezov said. The Kalashnikovs purchased by the U.S. are old weapons that have been in depots in Eastern European countries since Soviet times. "Today these weapons are to a certain extent modernized and then sold to Afghanistan’s government," said Rostec’s director. Experts added that the Kalashnikovs purchased by the U.S. are not only old weapons, but also new ones manufactured under license in Poland and Bulgaria. "The Americans are supplying Afghanistan with caliber 7.62 х 39 mm AK-47 automatic rifles from factories and depots in Poland and Bulgaria, to which the Izhmash plant sold a license for production of the rifles in the Soviet period, " said Dmitry Safonov, a military analyst with Izvestia. He said the Pentagon might also have organized purchases from Ukraine of caliber 5.45 x 39 mm AK-47s for the Afghan army. Experts believe that the Americans prefer the Russian assault rifle because of its superior qualities. "The Afghan army has used Kalashnikovs for decades because they function flawlessly in the region's stony deserts and arid areas," Safonov added. The Americans tried to nudge the Afghan army onto American-made weapons (AR15, M16, and etc. ), but they proved more difficult and temperamental compared with the AK-47, said Andrei Kirisenko, a former advisor to the general director of Kalashnikov Concern. "The choice has largely been made out of considerations of reliability - the Pentagon lost most of its soldiers in Afghanistan because of weapons failure during firefights. It was negative publicity, and it has thus been impossible for them to entirely equip the Afghans with American weapons," Kirisenko added. According to experts, no political conflict of interest is involved. Russia cannot independently arrange weapon supplies to Afghanistan since the U.S. finances the local government. Kabul, in turn, independently determines its own requirements and sends requests to Washington for weapon supplies. "The only problem is that since the collapse of the USSR the Kalashnikov Concern and Rostec have not been paid royalties by either Poland or Bulgaria for supplies of the assault rifles. They do not see it as necessary," Safonov said. The Russian companies have battled for many years to get the matter resolved, but to no avail. In effect, the East Europeans are making pirated Kalashnikovs. "The only country that pays royalties for supplies of Kalashnikov automatic rifles to foreign markets is China. As for the others, the matter remains unresolved," added Safonov.